North Korea is presumed to have launched a new type of solid-fuel intermediate-range ballistic missile (IRBM) using technology related to submarine-launched ballistic missiles (SLBM), South Korea’s Joint Chiefs of Staff (JCS) said on Monday. 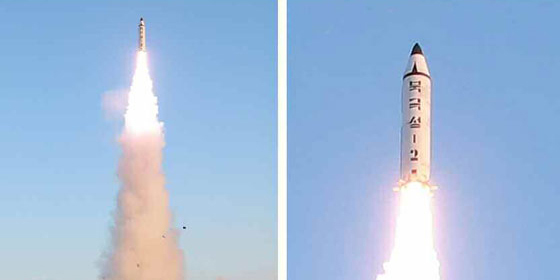 The missile, named “Pukguksong-2” by the North’s state-run media, is related to the Pukkuksong-1 SLBM, which was reportedly successfully launched in late August. The North’s Pukguksong-1 SLBM allegedly used cold launching technology, which ejects the missile out of an undersea submarine and to the surface of the water using high-pressure gas. The mobile launcher that the North used for Sunday’s missile launch is a “tracked transporter erector launcher (TEL),” JCS added. The North’s Korean Central News Agency (KCNA) said the goal of the test-firing of Pukguksong-2 was to verify the overall weapon systems including medium and long-range ballistic missiles using high thrust solid fuel-powered engines. LaFoy said that the liquid fuel Chinese Dong Feng-3 (DF-3, NATO: CSS-2) missile, using a hot launch system, needs 30 vehicles to support one launch whereas solid fuel DF-21 (NATO: CSS-5), which uses a cold launching system, needs only eight. The North claimed in March last year that the country had conducted a test for a solid-fuel rocket engine, something that, if successful, could pave the way towards shortened launch preparation times, making detection more difficult for the U.S. and South Korea. “It is easier to cross obstacles and move over steeply angled terrain on a track. The implications of a tracked TEL versus a standard wheeled TEL is it makes more areas accessible to it,” Grisafi said. Both military experts based in Seoul and Washington maintain the North may be self-producing the tracked TEL. “The tracked vehicle looks the same as mobile launch vehicle of RT-15 and RT-20 missile produced by the former Soviet Union during the 1960s, but it’s presumed that the North self-produced it.” Kim Min Seok, a senior researcher at the Korea Defense and Security Forum (KODEF), told NK News. “So, this appears to be something unique. I also notice that the treads look very much like those on the ‘Koksan Gun,’ North Korea’s heaviest self-propelled artillery piece,” Pollack said. 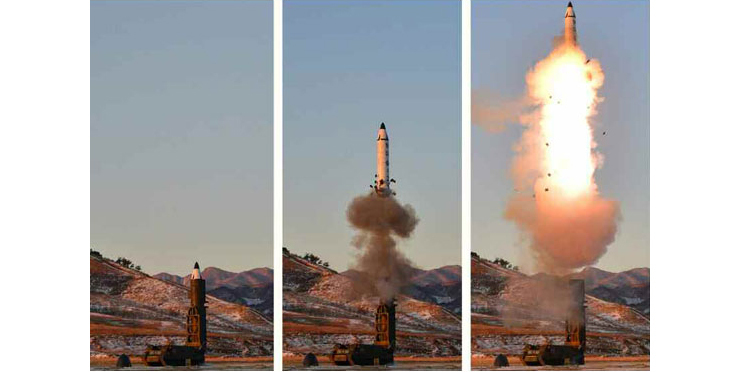 As the South’s JCS had argued, Pollack said the cold-launch system was “apparent” in the photos released by the North Korean media. Kim Min Seok also said that the cold-launch system had an advantage as it “caused less damage to the missile launch tube,” adding it’s usually hard to produce a launch tube that can endure the heat of the missile. 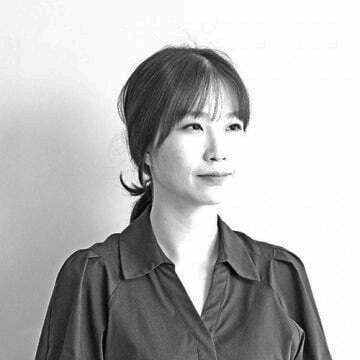 Kim said the designs of Pukkuksong-1 and Pukguksong-2 were “almost the same”, in the sense that two pipe exhausting gas were seen in the photos published by the North’s media. Kim Dong-yeop, Assistant Professor at the Institute for Far Eastern Studies at Kyungnam University, said the test may serve a long-range purpose. North Korea is presumed to have launched a new type of solid-fuel intermediate-range ballistic missile (IRBM) using technology related to submarine-launched ballistic missiles (SLBM), South Korea’s Joint Chiefs of Staff (JCS) said on Monday. 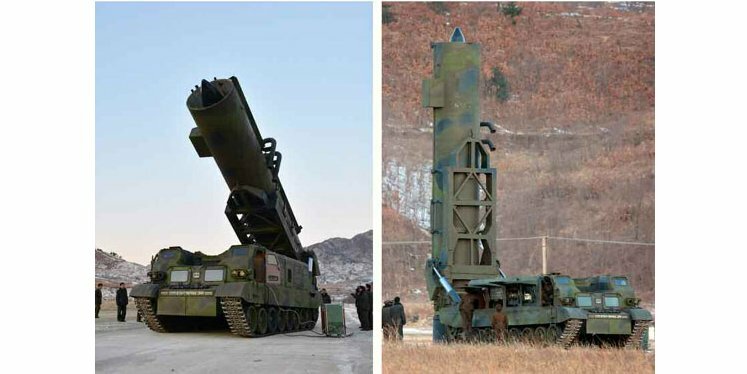 The missile, named “Pukguksong-2” by the North’s state-run media, is related to the Pukkuksong-1 SLBM, which was reportedly successfully launched in late August. Subscribe to read the remaining 964 words of this article.